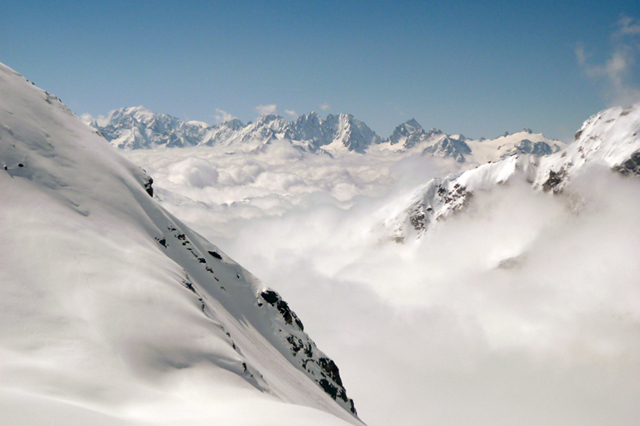 The Alps are the birthplace of modern alpinism and are filled with European culture that changes from valley to valley. 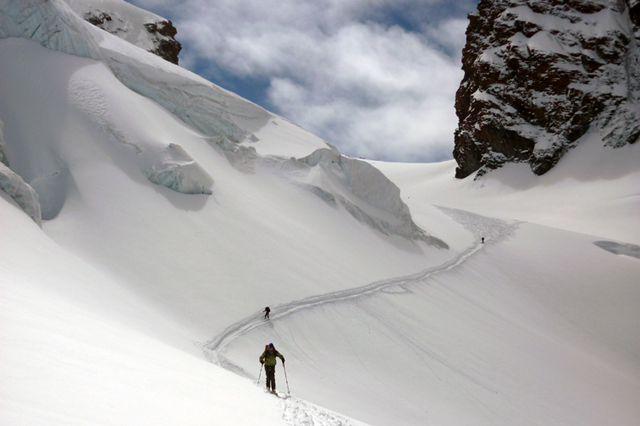 The world famous Haute Route ski tour connects the mountain towns of Chamonix and Zermatt by a series of high glaciers and passes broken by beautiful mountain towns. 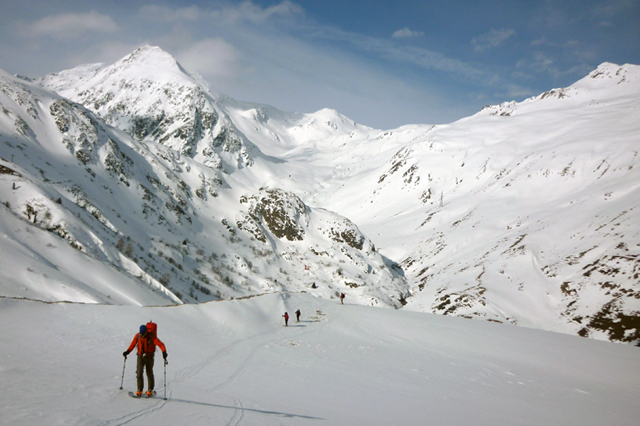 This spring ski package is an extended version of the Haute Route in which we will visit out of the way monasteries, quiet villages and alpine huts off the beaten path. Join us on our European ski tours through France, Italy and Switzerland while enjoying excellent skiing, views and European mountain culture. 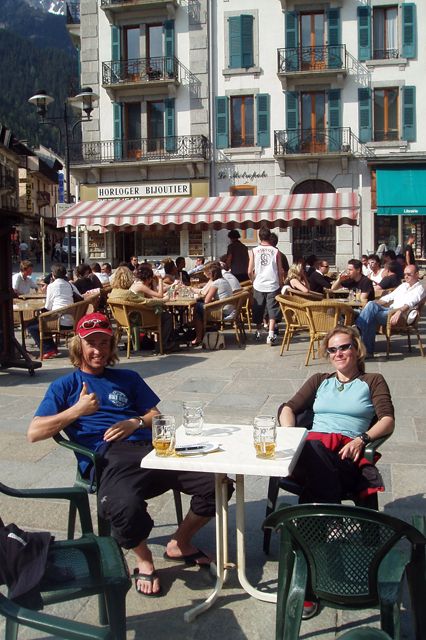 Day 1: We will meet at 1:00 pm at our hotel (included in price) in the town of Argentiere (10 min from Chamonix). This will allow us to check in, check equipment and prepare for the start of the trip. 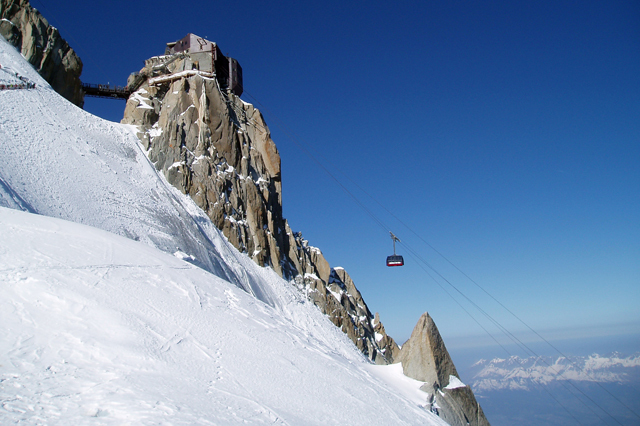 Day 2: We will board the Grand Montets gondola and ski the glaciers descending the Aiguille Verte to the Argentiere Glacier. A short but stunning climb to the Refuge d’Argentiere will allow us to acclimatize and also touch up on companion rescue. Day 3: With an early start we will either climb to the Col du Chardonnet or to the Col du Passon. 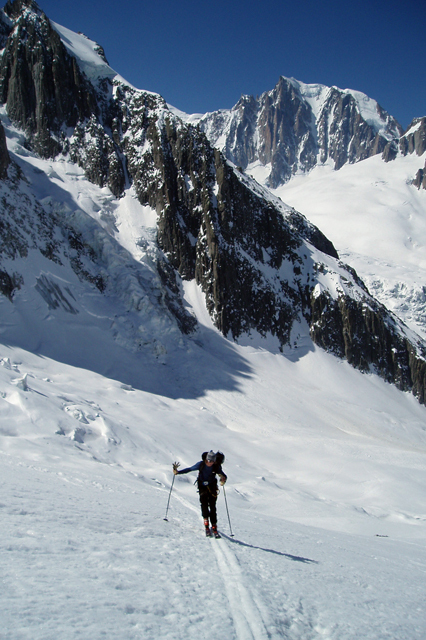 This is the first technical section of the trip which usually involves either being lowered or rappelling (Col du Chardonnet) or steep snow climbing (Col du passon) with skis on your back. 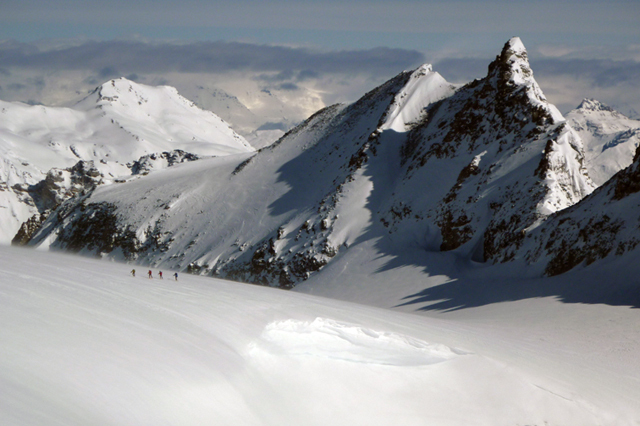 We will traverse the high glaciers of the Trient plateau to reach the Cabane du Trient. 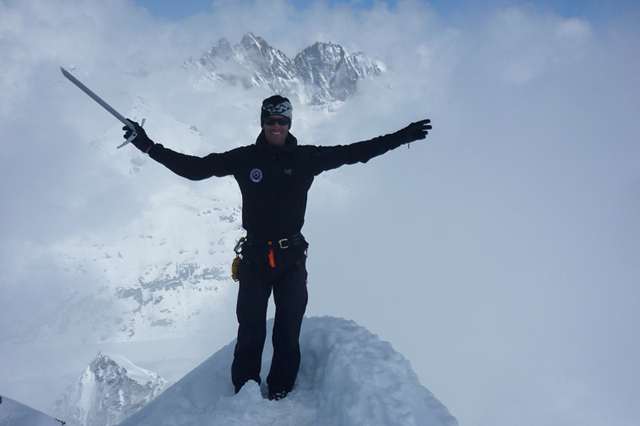 This is a beautiful and challenging day on the glaciers above the Chamonix Valley. Day 4: Breaking off from the traditional Haute Route itinerary, we will cross the Swiss 3 Cols route. This allows us to enjoy one of the longest descents of the trip and will bring us to the beautiful ski village of La Fouly. There will be time to purchase additional lunch supplies and explore the quaint village where we will be spending the night. Day 5: With an early start we will climb towards the col du Pointe de Drone. 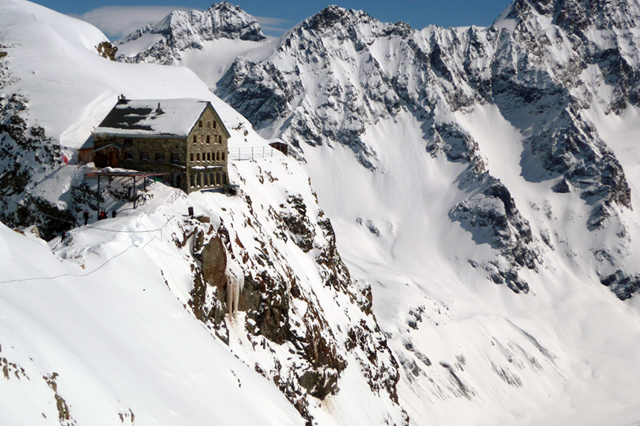 This off the beaten path portion of the route will climb steep slopes past 2 alpine lakes before descending to the Historic St Bernard Monastery. The Monastery which was established in 1049 sits at the highest point between Martigny in the Canton of Valais in Switzerland and Aosta in Italy. The pass has been a trade route since well before the Monastery was constructed and yes, this is the area that made the St Bernard rescue dogs famous! 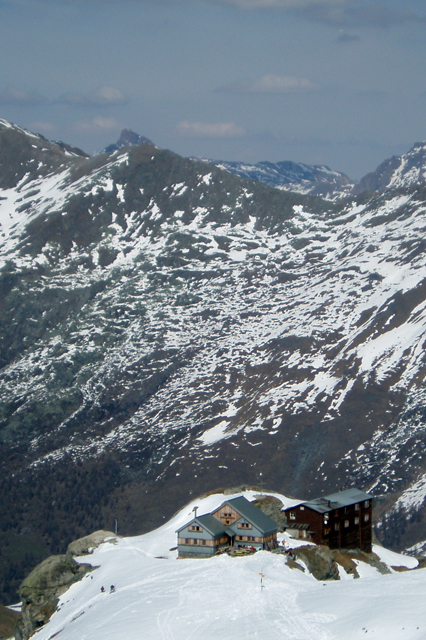 Day 6: After departing the St Bernard Monastery, we will descend to a taxi pick up and shuttle to Verbier. We will ride the lift and return to the traditional Haute Route. 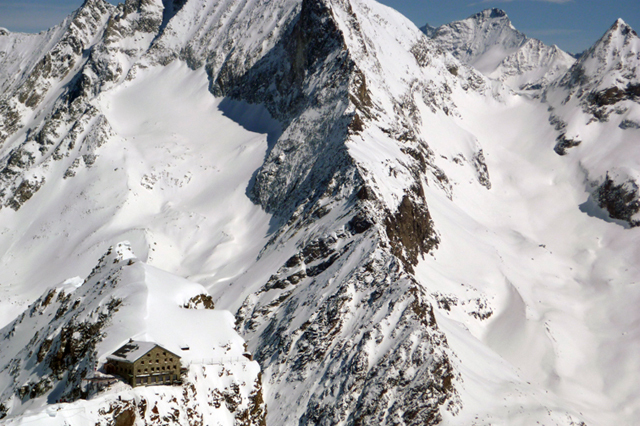 Our objective for the day will be to reach the Cabane de Prafleuri. 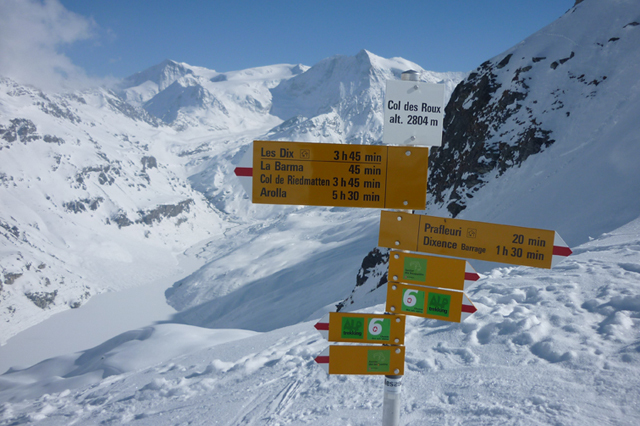 The route leaves the ski area and crosses 3 alpine passes before descending the glacier below Mt Rosablanche. 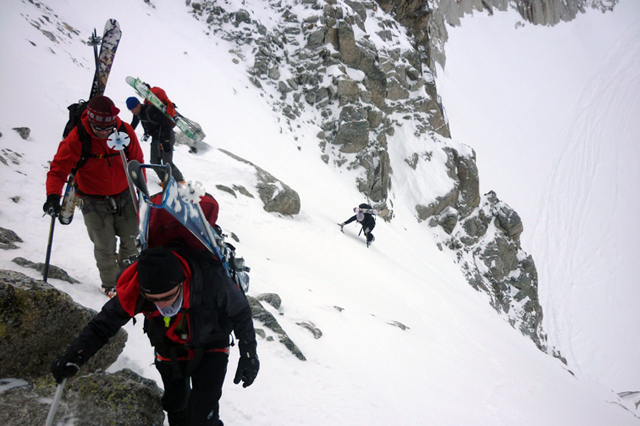 It is possible to ascend Mt Rosablanche on route which adds an excellent ski descent. Day 7: We will require an early start to traverse above the Dix reservoir and climb to the Cabane des Dix. 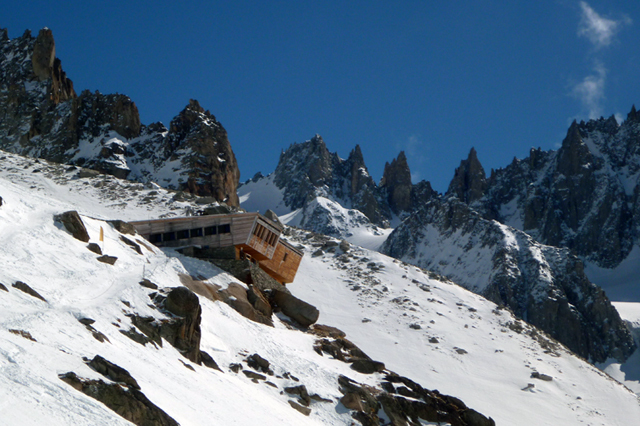 There are possibilities for additional touring above the Cabane des Dix if your legs allow! Day 8: This is a spectacular day in the mountains. We will climb from the Cabane des Dix up a twisting glacier to the summit of Pigne d’Arolla which provides excellent views towards the Matterhorn and back to Mont Blanc. After we have reached the summit we will enjoy a scenic descent to the exposed Refuge Vignette. Day 9: With an early start we will descend from the Vignette hut and climb to the Col de l’Eveque. Our descent will once again take us off the beaten path as we descend into Italy. 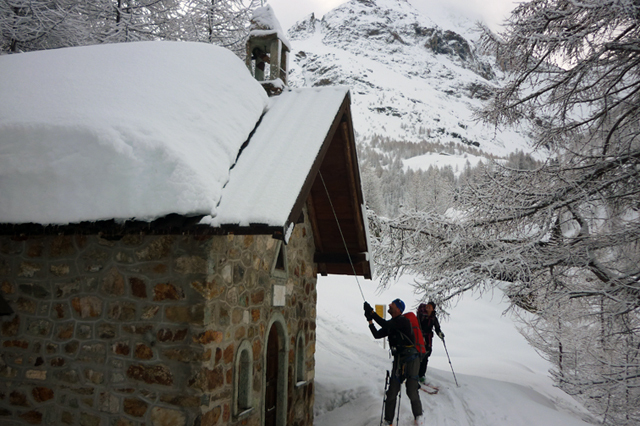 We will ski past the Refugio Nacamuli and continue down valley through European Larch forests to the Refugio. This comfortable hut has showers and an excellent cultural feel. Day 10: This is a rarely visited area. There are a variety of options depending on conditions but our objective will be to crest the ridge separating the Bionaz Valley and the Valley d’Aosta where we will enjoy a long descent. 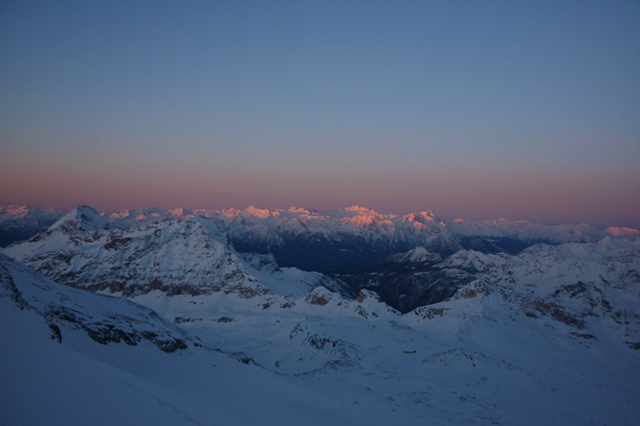 We will take a short taxi or bus ride into the ski village of Cervinia where we will spend the night. Your guides are certified by the internationally recognized Association of Canadian Mountain Guides. There will be a maximum of 6 participants per guide. There will be a maximum of 12 guests, minimum 5. 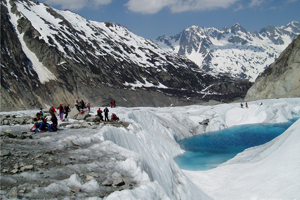 We will meet the group at 1:00 PM on the first day at the hotel in Argentiere. Please come prepared with all of your personal gear and clothing. You will be responsible for your costs to arrive in Argentiere, France and depart from Zermatt, Switzerland. Included in the price of the program is all transportation costs starting from Argentiere on day 1 return to Zermatt on day 11. This is a challenging program in complex terrain and as with any trip into the mountains neither weather nor avalanche conditions can be guaranteed. 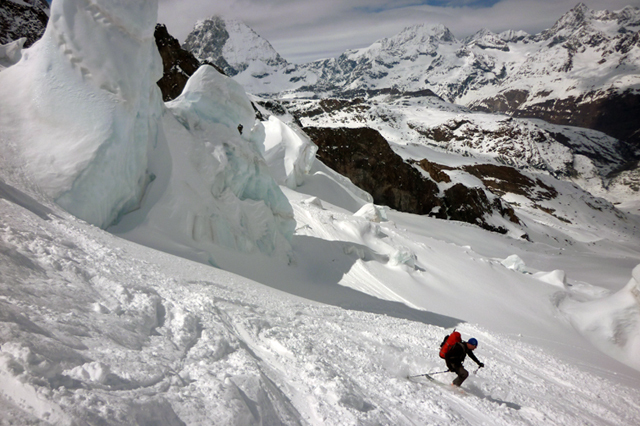 Poor weather or avalanche conditions may require a change to the itinerary. Regardless expect the trip to be a great adventure in a beautiful area. As well as the recommended travel insurance we will provide you with an Alpine Club membership which has mountain rescue insurance included. $3800 CDN includes certified guide, local transfers, breakfasts and dinners, accommodations Day 1 to Day 11 and basic lift passes on route. There is no GST on this program. Not included in this program is transportation to Argentiere at the beginning of the trip and transport leaving Zermatt at the end of the trip. As well, you will be responsible for your own lunches, drinking water and alcoholic beverages on the trip which can be purchased on route from the huts or villages. Additional cost involved for program changes due to weather or conditions are also not provided. This is a challenging trip with multiple days of touring in a row. 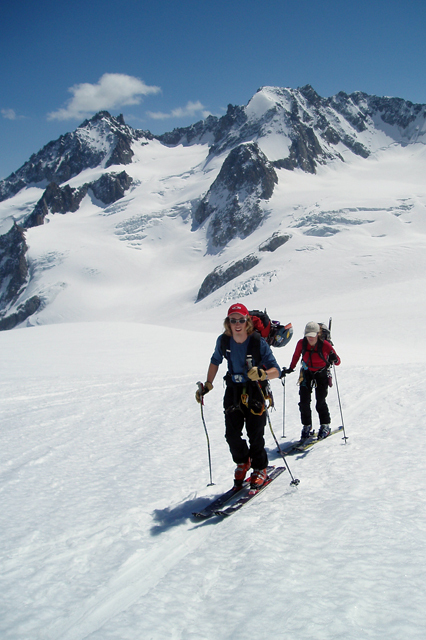 There are days of ascent over 1000m (3300ft) and you should be comfortable skiing with a pack (20-25lbs/9-11 kg) on most terrain in variable conditions. This would be suitable for people who have completed the Wapta traverse, Bow/Yoho Advanced ski week or a lodged based touring week.